TOKYO (Bloomberg) -- Toyota Motor Corp. joined Honda Motor Co. in saying it won’t use key components made by Takata Corp., as more automakers come out to distance themselves from the air-bag supplier whose defective devices are behind the biggest ever automotive safety recall. Takata fell 6.2 percent in Tokyo trading, resulting in a 39 percent three-day decline, the most on record. The company posted a 8.66 billion yen ($71 million) loss in the second quarter after the trading close, and slashed its full-year net income forecast to 5 billion yen from 20 billion yen. Honda and Toyota are the two companies with the most number of vehicles recalled because of Takata’s airbags, which have been found to rupture with excessive force and are linked to more than a hundred injuries and eight deaths. Mazda Motor Corp. also said on Thursday its new cars will no longer use Takata airbag inflators, while Subaru and Mitsubishi Motors Corp. are considering the same. The comments follow Honda’s decision to stop using Takata inflators in new models and its accusation that the company manipulated test data. The Nikkei reported Friday that Nissan Motor Co. plans not to use Takata’s airbag inflators in new models. The emerging rifts mark an unusual repudiation in Japan, where corporate relationships are measured in decades and Takata had counted on automakers’ support despite more than a year of criticism from U.S. lawmakers and its auto-safety regulator. Even investors appeared to think the worst was over, with the stock up 14 percent this year at one point through May. The tide turned this week when Honda surprised the market and set the stage for a potential exodus of more customers. Takata Spokesman Toyohiro Hishikawa declined to comment for this story. Nissan declined to comment on the Nikkei report, saying that it doesn’t comment on new models or relationships with suppliers. Any blows to Takata’s airbag business are devastating because it’s the company’s largest product segment, at 38 percent of its 642.8 billion yen in sales for the fiscal year through March. Inflators are only a portion of its airbag products, and other components the company has to fall back on include seat belts, steering wheels, electronics and child seats. 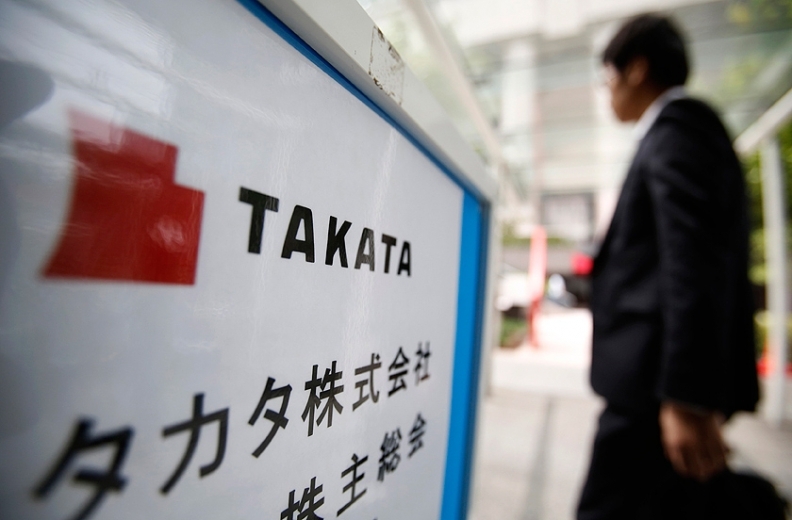 Takata has hired SMBC Nikko Securities Inc. to draw up a fundraising plan for the airbag supplier, with the financial adviser proposing an additional share sale as one of the potential options, according to people familiar with the matter. Takada said earlier this week his company was “considering some plans to survive” without elaborating on them. The Takata fundraising plan is still preliminary and subject to change, people with knowledge of the plan told Bloomberg. Takata had appointed SMBC Nikko to prepare a plan for when the root cause of the defect is established, at which point talks will get underway on its share of the recall costs, according to the people. Takata’s share of the global market for airbag inflators may fall to 5 percent by the end of the decade, from 22 percent last year, Valient estimates. “A lot of that is a result of losing major production contracts with their core clients, the Japanese,” Upham said. Honda made its announcement hours after the U.S. National Highway Traffic Safety Administration fined Takata $70 million, or as much as a record $200 million if the company fails to comply with the U.S. orders. The agency ordered the company to phase out ammonium nitrate-based inflators, linked to seven deaths and almost 100 injuries in the U.S., by 2018. NHTSA also said Takata provided “selective, incomplete or inaccurate information” to the agency and customers since at least 2009. Other companies are stepping up to provide alternative supplies to carmakers. By March, Daicel Corp., Autoliv Inc. and TRW Automotive will make about 68 percent of those components, according to a letter Takata sent to NHTSA in July. Honda, which has bought parts from the supplier for more than 50 years, said this week it will be able to get all replacement inflators from companies other than Takata in the foreseeable future. The carmaker will be buying the substitute components from all three of Takata’s competitors.